CSL director Col. Chris Beckert dedicates a 25-year plaque with the assistance of Gen. J. Lawton Collins' daughter, Nancy Collins Rubino. USAWC Commandant. MG William E. Rapp giving his remarks to the crowd in attendance. Current and former staff of the Center for Strategic Leadership turned an anniversary into a reunion, June 1 in Collins Hall. Recognizing the 25 years of service, CSL director Col. Chris Beckert dedicated a 25-year plaque with the assistance of Gen. J. Lawton Collins's daughter, Nancy Collins Rubino, while the many in attendance watched on. WGAL News 8's Matt Barcaro took a look inside our "Strategic War Gaming Room" to see how we test strategies that go to the U.S. Army's Chief of Staff. CSL Director, COL Chris Beckert, along with Strategic Assessments & Operations Research Division Chief, COL Ken Gilliam, talked with the WGAL news team about the value CSL has brought to the Army over the last 25 years. On 18 May the Center for Strategic Leadership (CSL) hosted the incoming class of International Fellows (IFs) in a "matrix-game" exercise. Matrix-style games are the centerpiece of CSLs "Wargaming in the Classroom" program. They have been used in the core curriculum, electives and the Distance Education department of the School of Strategic Landpower (SSL). For the IF exercise, students were presented a set of strategic problems to solve using the "Kaliningrad" game developed by the Strategic Simulations Division. The exercise was primarily a team building event. But, it also served to introduce matrix games to the International Fellows as an experiential learning tool. At the end of the exercise, students were able to articulate strategy using the elements of national power and also built and strengthened relationships with their fellow students. Feedback from students and staff was universally positive. This exercise is under consideration for becoming a permanent part of IF orientation and integration. 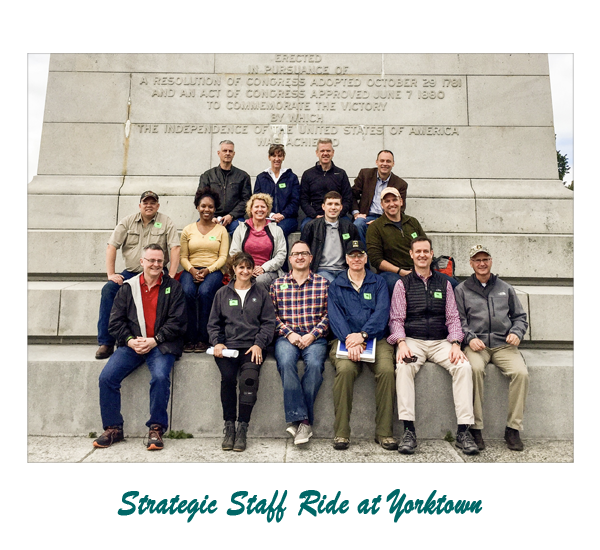 Over the weekend of May 5th and 6th, 2017, the Center for Strategic Leadership facilitated the first strategic-level staff ride of the Yorktown battlefield in the Army War College's history. The team of faculty and experts, drawn mainly from the college's Strategic Wargaming Division, partnered with the 80th Training Command (Army Reserve) to examine the strategic insights drawn from one of America's most significant campaigns. The leadership of the 80th prepared and contributed throughout the event, focusing on developing their leadership for the complex challenges of the Army's generating force. Yorktown provided the perfect backdrop for their lessons. 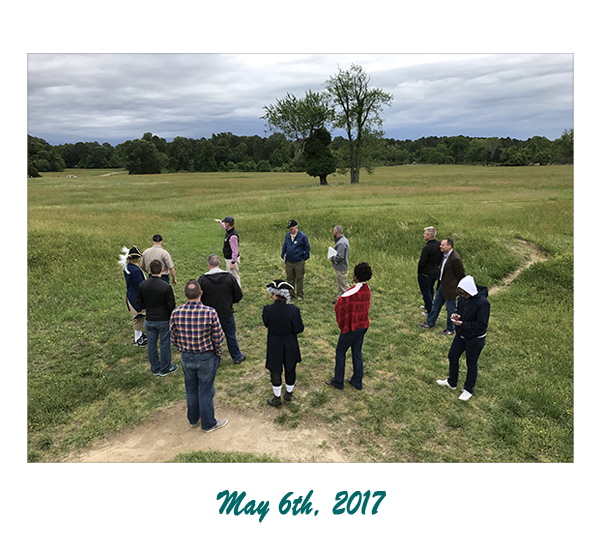 On Friday night, the 5th of May, the War College team presented the strategic Context for the battle to the staff ride group from the 80th. Rather than focusing on the traditional tactical aspects of the battle, the War College team presented a fresh perspective by addressing the strategic themes of the Yorktown Siege. Over dinner, the War College team discussed the strategic ends of the British, Americans, and French as well the themes of trust, alliance, and mission command; themes which would be shown as important then as they are now. 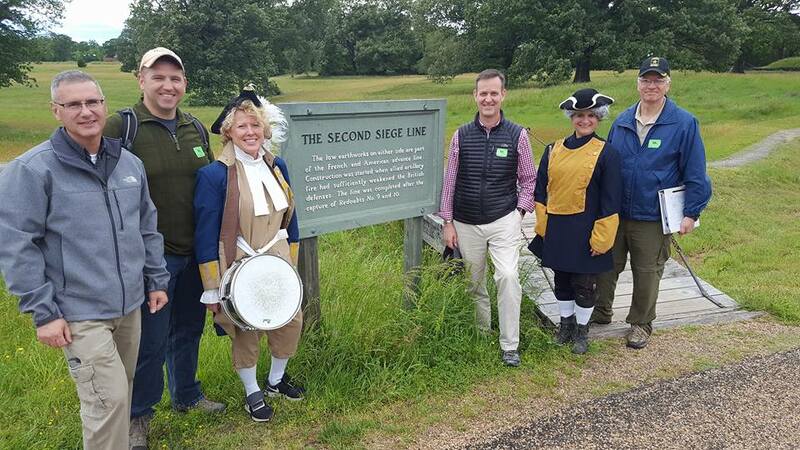 On Saturday, May 6th, the War College team and 80th CMD leaders walked the battlefield to cover the strategic themes from several different points. 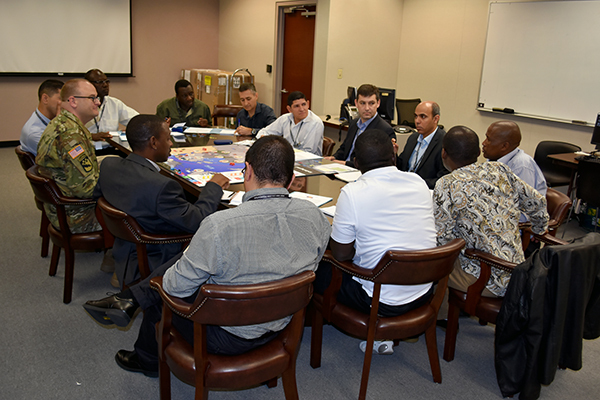 While the War College team presented the facts and context of the battle, the 80th CMD members discussed the strategic importance of the battle's aspects as well as relation to modern conflicts. As the group stopped along the several points of the ride, they discussed topics such as alliances and coalition operations, C2 between forces, commander's intent, logistics, artillery, and strategic leadership finally ending at Surrender Field. 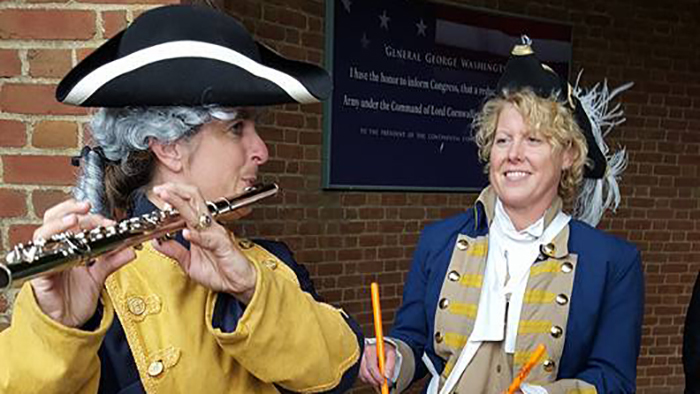 Here, each member of the 80th was able to articulate their take away of the strategic importance of Yorktown as well as the lessons to be learned for strategic leaders and many appreciated the fresh perspective on a familiar battlefield. In 1994 the Army embarked on the Army After Next (AAN) study plan to explore new concepts and think innovatively about how the Army would fight in the future. Envisioned as way to develop the Army after Force XXI (thought to be the Army of 2025), the AAN project was chartered by the Chief of Staff of the Army and grew to involve a wide range of participants. The Army War College contributed to the AAN effort through strategic wargames, experimentation and student and faculty research. One of the initiatives was the AAN Seminar - a special program in Academic Year 1997 - composed of students who were interested in contributing to the development of the future Army. "What kind of Army does the nation need in 2030 and beyond?" This 3rd annual compendium is one output of their thoughts. 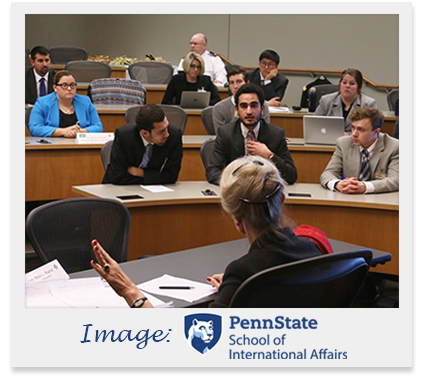 The International Strategic Crisis Negotiation Exercise held at the School of International Affairs on Nov. 11 and 12, which was hosted and led by former U.S. Ambassador and Assistant Secretary of State Robin Raphel. About 50 SIA students participated, representing parties including India, Pakistan, the United States, the United Kingdom, China, Russia, and the Jammu and Kashmir People's Democratic Party, each with their own goals to accomplish and deal breakers they would refuse to accept. The Collins Center Update is a quarterly newsletter detailing the activities of the Center for Strategic Leadership, United States Army War College. Articles in this double issue include, Basic Strategic Art Program Situation Report, C/JFLCC Course 3-16, USAWC Hosts International Analytical Exchange, Cyber Sovereignty - Operations Focus Workshop, The Human Dimension Department, Full Mobilization Wargame, Wargaming: Application of Innovative Approaches and Solutions, and the Department of Technology Integration (DTI) Update. The Lehigh Valley Discourse host, Pamela Varkony, spent four days in early June attending the War College's 2016 National Security Seminar. What she learned is the topic on this edition of Lehigh Valley Discourse. Joining Pamela from the U.S. Army War College is BRG George Schwartz, Deputy Commanding General - Reserve Affairs; Dr. Richard A. Lacquement, Jr., Dean; and CSL's own, Professor Bert Tussing, National Security Expert. 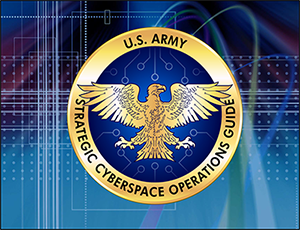 This publication provides a guide for U.S. Army War College students to understand design, planning, and execution of cyberspace operations at combatant commands (CCMDs), joint task forces (JTFs), and joint functional component commands. It combines existing U.S. Government Unclassified and "Releasable to the Public" documents into a single guide. The guide follows the operational design methodology and the joint operation planning process (JOPP) detailed in Joint Publication 5-0, Joint Operation Planning and applies these principles to the cyberspace domain found in Joint Publication 3-12(R), Cyberspace Operations. It also includes an overview of cyberspace strategies, guidance, and doctrine as well as a description of U.S. Government, Department of Defense, Joint, and Service cyberspace organizations. This year's faculty awards ceremony took place on the 25th of May. 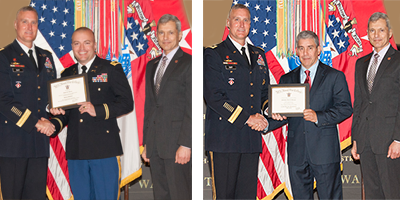 The faculty members receiving awards exemplify the very high standards of excellence that characterize the USAWC faculty overall. In all, 48 faculty members were recognized at the ceremony. Prof Alan Bourque received the General George S. Patton Chair of Operational Research and Analysis. This chair is given to recognize the outstanding performance of a member of the USAWC faculty who has made significant contributions to the study of the strategic and operational levels of war. MAJ Jason Warren was recognized for an Academic Promotion to Assistant Professor, as well as receiving the Excellence-in-Scholarship (Madigan) Award. This award annually recognizes the best scholarship that addresses topics related to the USAWC curriculum. 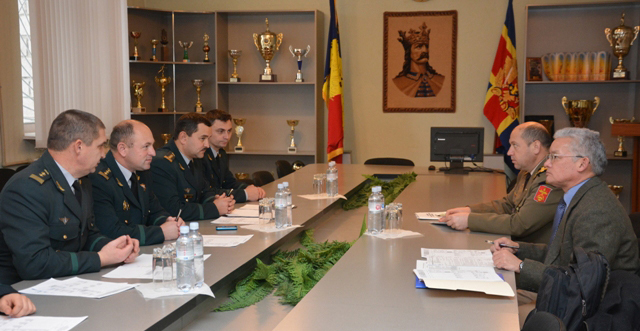 Beginning in 2009, a multinational team of NATO professional military education (PME) experts began providing assistance to the Republic of Moldova's Armed Forces at the Moldovan Military Institute (later Academy (MMA)) in Chisinau. The team's broad purpose was to help the Moldovan military adjust from a Soviet-style military educational system to one that more closely mirrored NATO and Western standards. First was revamping the "Basic Course," followed by the development, from scratch, of a senior officers' course, including a Master's degree (Level II) program, which was completed in a remarkably short time - less than two years between initial brainstorming and course start. That it took a "team effort" goes without saying. While the Moldovans could not have done it alone, MMA was at the epicenter of successful multiple efforts, all designed to modernize its PME to meet the demands of the 21st century operational environment. "What kind of Army does the nation need in 2025 and beyond?" 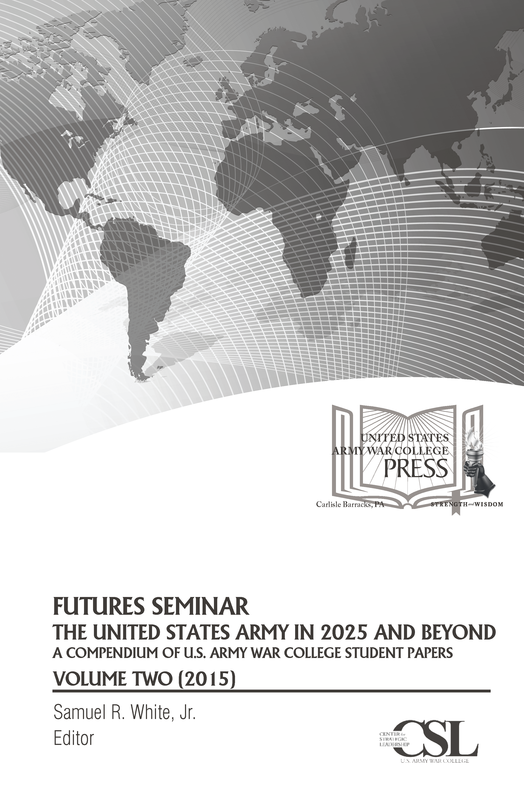 This compendium represents 23 students' peek into the Army of 2025+. Some ideas and recommendations are specific and affect narrow slices of the Army; others are broad and span multiple services or components. Some are tactical; others strategic. Some very aspirational; others very practical. Regardless, they are the thoughts of strategic thinkers who have embraced their responsibility to help posture the enterprise for the future by thinking and writing about tough issues. The enterprise is better for their effort.